... and their temple is Tuebingen! On 12th November 2011 the Nauck family set out on their pilgrimage to Germany for the visit of the Weinmarkt Mattheis' wine fair (in German). This trip is now marking the starting point of a family tradition - yes, two visits are enough to call it a traditional event - and plans are already in progress for 2012. Last year we travelled to show our support for a mad and daring friend who after a life of work in the IT business bought the Weinmarkt Mattheis starting an endeavour others only dream of. Back then we were taught a lesson or two: a lesson about wine, and a lesson about how not to travel to such an event. 2010 we had one suitcase for two people and in 2011 we travelled with two suitcases: one for the people and one for the wine. For the first time I checked in an empty suitcase... oh well, not really empty, it was full of bubble wrap. ... and we still missed out on one wine we really liked. Only solution: We need bigger suitcases! That brings me to the lesson learnt about wine. See, last year we were flabbergasted and a bit overwhelmed by the richness of range. Only thanks to the wonderful atmosphere, the Mattheis team and the wine producers who where so enthusiastic about their produce we found a starting point. This year we just wanted to take it from there, and we wanted to find some gifts for friends and family for Christmas. How wonderful is that: We taste, we decide, we write a card, we pay, and Weinmarkt Mattheis sends it of right in time for whatever date we wish. So off we went with our wine tasting list firmly in hand. For Christmas gifts, and as an incentive to bring the family together for next years event, we decided for some local wine. Digging into last years faint knowledge we stumbled over table 8: 'Collegium Wirtemberg' had a 'Lemberger', a grape not too well known and rather lovely. I usually only like my wine together with food, I don't like it too sour or bitter-ish, something that wine connoisseurs call tannin or barrique which means the wine was ripened in oak barrels and hence tastes like wood... This Lemberger didn't have any of that and hence is a nice and easy wine for people who are not really into wine. Interestingly enough it is as well a nice wine for people who are into all that stuff; Detlef liked it, too. Well, actually one is not supposed to drink it all. Plenty of containers to dispose of unwanted quantities of alcohol were dotted around the place... just that most of the quantities were very much wanted. Slightly more clearheaded we very scientifically tried the Lembergers against Pino Noir, liked some, but not enough to buy, and ... ended up at table 8: Well, with that one we hit straight into the high end of the price range, but boy what a wine. Local, we both liked it, perfect, another gift sorted! We needed one more present, though! 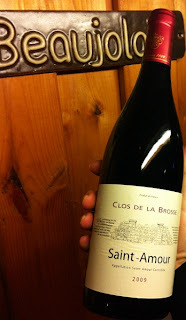 Mother-in-law is very much francophil, hence we needed a French wine. Oh my, I don't like French wine. Whenever I had those they tasted like vinegar. Next lesson learnt: either drink it in the country of origin or use wine tastings, but don't just buy supermarket. Beaujolais is usually known for 'Beaujolais Nouveau'. There is such a hype around the launch of each years Beaujolais which is beyond my comprehension, especially that it is a new and hence rather weak wine. Thanks to the advice of our host we however got lucky; we found a Beaujolais which is just lovely with an even lovelier name Saint-Amour. Fruity and easy going, and definitely far from water mixed with vinegar. So we decided to bring a bottle for us, too. See, at that point it really appeared to us that we need more training and that hece next years event is mandatory: we were tipsy again and had to eat more with the result of a very stuffed feeling. We could not allow letting our lovely hosts down, a brisk walk was in order and the next range of wines could be tackled: Whites. That pretty much was my personal quest as Detlef doesn't like Whites... I don't like them either, they seem to always have something sparkly about them, brrr... I however found that some foods don't take Reds well and from a chef's point of view there must be at least one white wine that is suitable... and we ended up at table 8: Pinot grigio from 'Collegium Wirtemberg' is my solution. I learned that the grapes look a bit small, shrivelled and like gone bad, but hence produce a wine which is rather fruitful and which even works with Asparagus, a vegetable apparently almost impossible to compliment with wine. Well, I call that mission accomplished! And now the two biggest wines we bought, and the grape we both love most when a grand wine is asked for, the one that you drink after dinner at the fireplace while reading a good book, possibly with a bit of a cheese to nibble on.The Primitivo from the South of Italy is just divine. We had a bottle of the Sessantanni Primitivo last year, I remembered that I liked it, but for the love of God could not remember how it tasted. Now I tried it again and it hit me. I, Rika, the one who doesn't like bitter, sour or spicy got bitten by a wine that tastes like cloves - who would have thought? Again I learned a little lesson. The stories people make up to describe a wine make sense in a way. Although we laymen may not get what the experts are talking about it makes sense for me to make up my own stories.The little szenarios I build around each of them hopefully will help me to remember a particular wine in the future. Well, I know that there is a name on the bottle, but honestly: Who comes up with those? and then I still can't remember what's in the bottle. Not enough, though! Our host demanded an opinion! 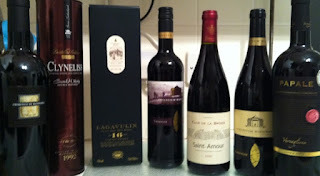 There was another Primitivo, almost the same price, different area and again: Oh boy! Same grape soooo different, fruitier, less Christmas pudding more Black Forest Gateau...dunno... I guess we just will indulge in both of them when the time is ripe. This last one has a sweet brother, the Primitivo di Manduria Chicca. Oh, this one definitely is mama's boy. Unfortunately the suitcase was full and mama will have to wait another year to be able to take it to her heart. This lack of space was caused however due to another quest: Where would one be able to taste Whiskeys? We already had three different bottles at home and the fate of each of those lies in being mixed with coke. We wanted Whiskey that rolls nicely over the tongue and leaves a nice and warm taste. Ten open bottles in front of us, two recommendations from Juergen and as usual they were spot on and as usual we couldn't decide. Detlef likes mine as well, but there was a very strong and smokey one which grew on him, so we had to take them both. That should last us a while and next year is another year. New wine and loads of new ideas for the wine shop as well. Juergen is planning for tasting stations and a colour scheme to help customers to choose the right wine for their dishes. Wine demystified! And here is a toast to a mysteriously misty November weekend and a cosy Christmas time: ... hic! On one hand one needs them desperately, on the other, they throw everything off whack. This however is how human beings are. Through evolution we are built for change, that is why we are so successful as a species. Darwin often gets misinterpreted as ‘the strongest survives’, the reality is: The most adaptable survives! We are an incredibly adaptable species, we can gain strength, we can become more enduring, we can store nutrition in form of fat for future use, and we can endure severe famine. The problem is that our lifestyles don’t allow us anymore to develop the intuitive feeling that our forefathers had: How much nutrition to eat and when. The joy of eating and the cravings when we see or smell certain foods is built into our systems. In the olden days we needed to be prepared to eat vast amounts of stuff when it was there; either because it was the season, or a hunt was successful. Nothing could go to waste as the next dry spell was likely to be around the next corner. Occasional overeating made sense back then. ... just that now there are no dry spells anymore and processed foods have destroyed our natural sensors. We always admire people who have found their balance, always look the same, do their exercises like machinery, and are enjoying this lifestyle. I however believe we don’t admire them for their looks, or their determination. We admire them because they have it ease; they actually have no determination as they don’t need any. It is how they are. Their sports lifestyle is as easy for them to achieve, as it is for us to have a sloppy one. We should admire the people who find ‘the middle way’; the ones who have learned again the skill to take it when it is there, and to stop when it is not needed. We have to create our own ‘dry spells’. In religious circles they invented fasting, a rather dramatic form which I find overrated. Alternative medicine took on this concept and when I was at homeopathic school I fasted twice, properly, as described in the books. The first time round was ok, I lost a lot of weight, could even train a bit, but the second time round my body started to rebel, and since then I am getting stomach cramps when I am badly hungry. And it doesn’t have anything to do with keeping a balance. Famine is the worst of nutritional environment a person can be in, and even in the olden days, tribes had ways to preserve food during good times and had some resources during the bad ones. Famine should actually not happen when we manage ourselves and our environment well. What I mean is keeping the balance between nutrition overflow during seasonal events, and basic nutrition to just keep your body going during the daily activities you have chosen to tackle. We need to find that switch that puts us quickly from one mode into the other. We need to accept our heritage and acknowledge that the aim doesn’t have to be ‘building the perfect person’, but creating a lifestyle that enables us to enjoy the moment we live in’. Be it the a rest during Christmas meal or the holiday indulgence, as well as the morning run or the gym session including the food that is best for us then. The aim is a life free of guilt! Humans are incredible creatures, and many of our creations were inspired by people who live the moment. Don’t just feed your body; feed your soul as well! First published in Jan 2010, and now in 2011 basically in the same situation, just this time it's the Bodybuilding competition is upon me in June instead of a photo shoot. Let's see what January 2012 will bring. However, that I am going down each winter only shows that I am human, and that I have something to go down to, shows that my way of losing weight actually works. My skin is getting tight, and now end of February I am feeling pert and fit already. Off into a new summer we go! So! I have to shed a couple of pounds… actually I have to shed something like four couples of pounds! Oh well, all of the above is true! But, what if…? ... what if you get the once in a lifetime opportunity to go on a photo shoot with a semi professional photographer who wants to see muscle and not wobblies? ... and what if you are 48 and are wobbly around certain areas? No two ways about it – you need to shed some couples of pounds – quickly! Luckily, thanks to the Big Sugar Experiment I already was on the roll. I didn’t weigh myself because I had a hunch that over winter I had gained about a stone – which for me is about a good dress size – and that about half of that was gone already; so I was sort of back to the state of last autumn. What I need now is back to a state I have never been in! One of the things to be persistent about is to stick with the sugar experiment. No sweets have touched my lips since that week after Easter when Imola’s cry for company reached me via Twitter. Whoops, there is one more thing to be persistent about: Be truthful at least to yourself! I had two slices of b-day cake …which I don’t regret as they were really yummy and didn’t cause me to fall back into bad habits. The next thing is to count calories. Not every single one, but for food units. It’s all about getting to know my actual needs again. By the time I will have achieved what I wanted to achieve I should be able to go back to auto-pilot and forget about the counting. One is so forgetful when eating; one doesn’t tend to be very accurate in remembering. I basically know my bits and nevertheless completely lost track during this last winter – so if anybody out there would want to try it out: Forecast your daily calories and then start counting. Compare the numbers at the end of the day… You will be surprised! And you are not alone. Detlef, dear hubby, told me that he read an article about people being asked to keep a food diary while being filmed at the same time. Turns out they forgot to note down about a third of what they had eaten. Not that they wanted to cheat, they were just eating without thinking. Me, Mrs. Stuck-up, thought that couldn’t happen to me…I just count in my head … I’m so good at this… Ha! … an egg here a glass of Shandy and a cappuccino there and all of a sudden I was a couple of hundred cals over… Oh, crumbs! Now I have a sheet of paper and a pen in the middle of my kitchen and nothing touches lips before pen touches paper. There we are back to the rules-thing. To make something work one has to have a framework and stick with it! I should read my own website more often! 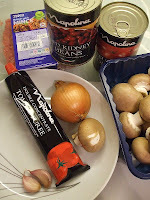 This food thing really is a biggie…because it is difficult to know the calories of stuff one mixes together when cooking random recipes, I am sticking with a few recipes I measured out. Sort of weightwatchers like – just that they charge you a lot of money for doing the measuring for you. So I am basically thriving on Voluptuous Lettuce, pasta version because I know it makes around 500 cal, Chicken Soup where a bowl is setting me back a 400 cal and stuff like bread with cheese, boiled eggs and bananas. That sounds very boring, but it has all the fibre, protein and veg my body needs to stay fit and healthy. So I got lucky that already a while ago I found my set of non-threatening food stuffs that I really like. That saves me some time now, although it is fun to create new recipes and to measure and count, so I will know that I can indulge in the food I love and how much I can have without feeling guilty. There is however, one big hiccup in this mad and mean game! One doesn’t really know which activity burns how many calories, so one doesn’t know how much per day to aim for. I had a compelling experience with a friend who was rowing on the indoor rower for the first time. She did brilliantly well, and after 20 minutes the display told her that she had just burnt 200 cal. 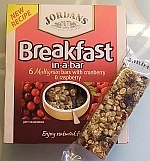 The poor thing was so shocked and instantly regretted having eaten that biscuit earlier that day, worth about 100 cal. She had no idea how little energy the body uses - actually it’s the other way round: How much energy these lovely little food items have that we stuff into our traps without really thinking about it. There should be laws against certain food preparation habits: Never mix flower with sugar, or fat with sugar, or flower with fat! And none of the above is to be combined with eggs! This way bakery would go out of the window and never bother us again. So, how much is it that Mrs. Normal can eat per day? … and 2300 for the gentlemen, as usual – they have it better, but looking around me they don’t really make use of it. They just like their beers too much, it seems. Losing 1kg of fat – how many calories is that? That is two and a half day of not eating at all – what wouldn’t really help since a body is a sneaky lazy thing. It always chooses the easy way which is consuming muscle rather than fat, so one would not just have lost weight, but all the energy as well. This is why all those 'lose 3kg in a week' diets can never ever work. A weeks food allowance for a woman is 14 thousand cals while three kilos of fat is 21 thousand. Even if I wouldn’t eat a thing I would be 7 thousand short. Not gonna work, is it? All these short term diets play with the water content of the body. They drastically reduce salt and are laid out to make the body lose water – that can make up to 2 kilos. But at one point the body will retain it again, so it’s not a real fix. … and must be taken care of in a way that we can live with it for good! Muscles burn a lot of calories! What do you think why I am a muscley girl? OK, I like it, but if I wouldn’t have them I would get fat from just looking at food. So for me it’s the more muscle the better! 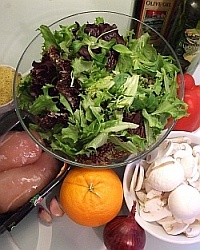 Realistically one can save 500 cal per day by eating less and moving more which equals a pound of fat per week. So: 4 weeks to go! That makes 4 pounds - oh well, it’ll have to do! One has to choose the goals realistically to not be disappointed. This whole thing has one brilliant side effect: I am saving a lot of money! My food is simple hence cheap and I don’t need a lot. Oh my, all this money put into cakes and biscuits - and I am lucky that I don’t drink alcohol… Since we are doing a lot of numbers and conversion here I probably should now transfer calories into pairs of shoes or t-shirts. Don’t start the food stuff during the second half of the cycle - during this period the body demands more carbohydrate rich food. Get yourself a head start during the first half, and then just try to maintain the level during the second half. Never use a scale during the second half of the cycle – women tend to retain up to 2kg of water during this time making it appear as if you were gaining weight despite eating less: Extremely frustrating, you don’t want that. Never, ever use a scale more often than once a week. It is just natural that on a daily basis the weight is changing up and down a couple of 100 grams. Don’t go scale-bonkers. You will feel from your mood and how your clothes fit whether or not you are getting there. Don’t be disappointed should you go through a phase when with less fat you actually look worse. Fat loss usually happens faster than skin tightening – hence the take it slowly, girl! The slower the better the chances are that it will become all tight again. And – no two ways about it – to get a tight skin one needs the exercise. Take good care of your skin. Massaging with special oils and natural Aloe Vera can even help a bit with stretch marks. My personal favourite is pure Aloe Vera gel. It smells a bit like onion at first but that stuff is just brilliant and I use it all over, even in the face and as eye gel. Do your own weightwatchers thing: Choose the foods you like and which give you a good mix of a lot of protein and fibre, medium amount of slow carbohydrates, and little fat and measure out the calories per portion. Have fun in the kitchen and be creative, combine stuff that nobody ever did… as long as you like it! During weight loss phase: Steer clear of sweets and alcohol. When on the right weight: Lose the ‘daily’ approach and get a feeling for what your weekly average is. Measure cals of treats like sweets and alcohol and transfer them into sportive action. No action, no treats! If the waistband is nipping again, quickly steer clear of sweets and alcohol again. Sometimes a couple of weeks is enough to get back on track. 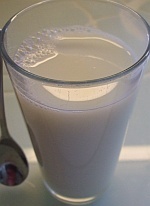 Be vigilant of colds… less activity and cravings for carbos are a killer. Don’t try to fight it during cold, but take remedial action as soon as it is over. It’s not about the weight! It’s about losing fat to a healthy level. It’s about keeping/building muscle to stay/become fit. And now we have a video demonstrating the effort needed to burn just 100 calories. So better don't put them on in the first place. Carne means meat, so please don't beat me up for making it with pork mince... Just feel free to change to beef or chicken, or quorn for a veggy version. I never really got the difference to Bolognese sauce, but I was never really good in sticking to a recipe anyway. My Bolognese always had mushrooms, so why not add a few beans and chilli powder and we have a chilli. So, as usual with my recipes feel free to amend. 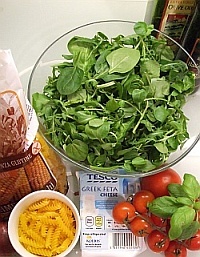 Don't like garlic - leave it out, fancy some fresh or dried basil - be welcome to add. My version is worth 100cal per 100g finished dish. Now prepare everything before you heat the frying pan; throwing it all together will go very quickly, no time to prepare stuff in between. From the mushrooms cut off the ends of the stem, if they are grey in the middle and feel a bit soggy take them out and throw away. 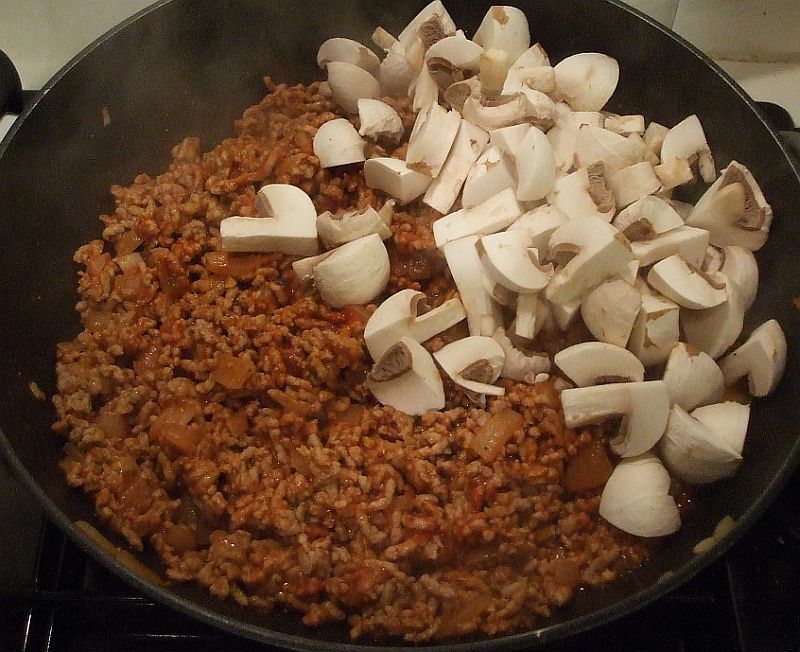 If the mushrooms peel, then peel them, otherwise just very quickly rinse them (but only if they are still closed, they hold water like a sponge) and roughly chop them in 4-6 pieces each. Peel the onion and cut it in rough cubes. Peel the garlic gloves and roughly chop them. Pour the tomatoes into a bowl and check for funny bits, take them out and roughly mash the tomatoes, works best by using hands. Drain and rinse the beans, there is sticky stuff at the bottom which I don't like. Heat the frying pan with the oil full power. 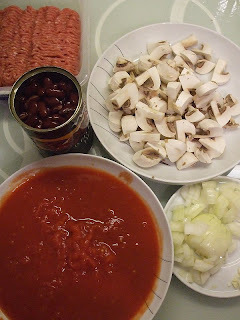 Add the onions, stir until slightly brown, careful with red ones, it's hard to see. Add the garlic and brown as well, careful, goes very dark quickly, should you get into the danger zone, take off the heat and quickly, add a little sip of water to make it boil; on that occasion you might want to open a window. 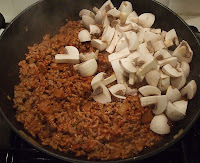 Add the meat and stomp and stir until it becomes all crumbly. Sprinkle the spices and thoroughly mix in. Stir it all together and put the lid on. On lowest heat, let simmer for an hour. Stir 2-3 times especially towards the end to check that it is not sticking. Then melt in the Philadelphia cheese. That makes about 1250 calories per pot. The whole pot weighs 1200g. That means that 100g cost approximately 100 calories. dark, strong yet fruity red wine. Offer a simple salad of strong leaves like lamb lettuce, rocket and spinach, mixed with cherry tomatoes and a balsamic dressing to add some freshness. I love to invent recipes and those lettuce arrangements are irresistable. In case your kids don't like them, pretend that they are only for grown-ups anyway and protect your plate with your life. From those flavours they may come round to it very quickly - well, and wanting to be grown-up might help a bit! The lettuce is whatever lettuce you like, really. I prefer the stronger nuttier flavours like rocket, lamb lettuce, watercress mixed with spinach leaves, Lollo Rosso or Romaine lettuce. But milder varieties work as well. 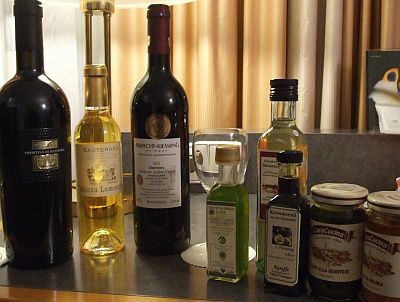 I only use Extra Virgin Olive Oil and the vinegars are white and red Balsamico. It's all I have. If you have oils and vinegars you prefer - give it a shot. If that's the flavours you like and are used to the dish will adapt. The amounts of olive oil and vinegar are estimates. Please adjust freely as you go along. For me it depends on the weather and my mood how sour or slippery I like it. Again, the pasta is whatever you like. 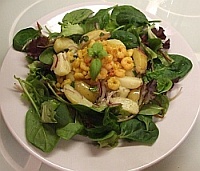 I discovered corn pasta recently and love it - and they are of a nice yellow colour. 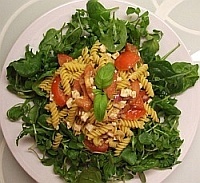 With a stronger lettuce whole wheat pasta are nice, while a standard white flower pasta makes a more subtle dish together with mild lettuce. You even could do it with Ravioli or Tortellini, but be aware of the added calories. I use dried pasta as I always have them in the house, but of course you can use an equivalent amount of fresh pasta. Add the chunkily chopped onion, chopped tomatoes and chopped Feta cheese and stir. Once the Pasta are ready, strain them and add them hot to the mix and stir in quickly. They are supposed to melt the outside of the Feta cheese a bit. Place in the middle of the salad base and serve. Using just very few tortellini or ravioli per person, this makes a great first course for 4 people. As this type of pasta doesn't mix in very well for warming up the mix you can put it into the Microwave for 1 minute and then stir before gently mixing it with the pasta. I like the baby or Charlotte potatoes, but any potato you like will do. I keep them with the skin but that is not essential, although healthy. I cook potatoes in the microwave. Microwave pot, potatoes and 1/2" (1 cm) water, 6-10 mins highest setting (depending on amount and power). After half the time move them a bit around and test them. The prawns I usually use are peeled, pre-cooked and frozen. This way I always have some in the house. But you can use any of those sea creatures. There are those thingies with the tails on. You might want to give those a try if you like. They look decorative - are a bit trickyer to eat, though. 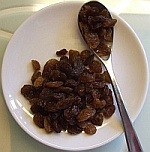 Again the topping is a bit luke warm, thus makes it a great starter for guests if you divide the portion by 4. Wash the potatoes and prepare them for cooking. 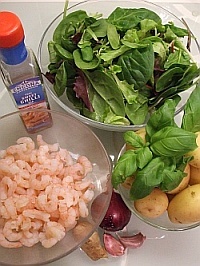 If you want to have it for guests keep the lettuce, prawns (fridge), chopped garlic/ginger and the mix covered. When the guests arrive start cooking the potatoes (use hot water when cooking on the hob). 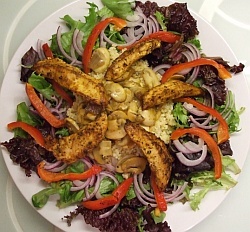 Arrange the lettuce into a nest on a big plate. Heat the rest of the oil in a frying pan on medium heat. add the garlic and stir. then add the prawns and mix. add some lemon juice to taste. Quickly half/quarter (depending on size) the potatoes, add to the onion-basol mix and put it into the nest of lettuce. Stir the prawns and put on top of the potatoes. Remove the seeds of the peppers and slice them. Pre-cook the broccoli in the microwave for a 2 minutes (the moisture from washing is enough to steam them) or steam them until almost done. When the peppers are still a bit crisp add the broccoli and the Chilli sauce. By the time the rest is finished they are done as well. This is a great addition to a BBQ. Leave out the lettuce and the prawn/veggy topping. Just create it as a potato salad adding some broccoli about 3/4 of the amount of potato you are using. Basically basil, onion, broccoli should be about the same volume as the potatoes. add flavoured oil or a bit of chilli powder. Mix it all together still warm. Serve warm or keep at room temperature. It's a shame that this one is more time consuming than the others, because it is my favourite. The bulgur is soaked and not cooked, thus it's 'al dente'. The chicken is best if marinated for a while, the red pepper is best if smoked, and the mushrooms need a bit of attention as well. 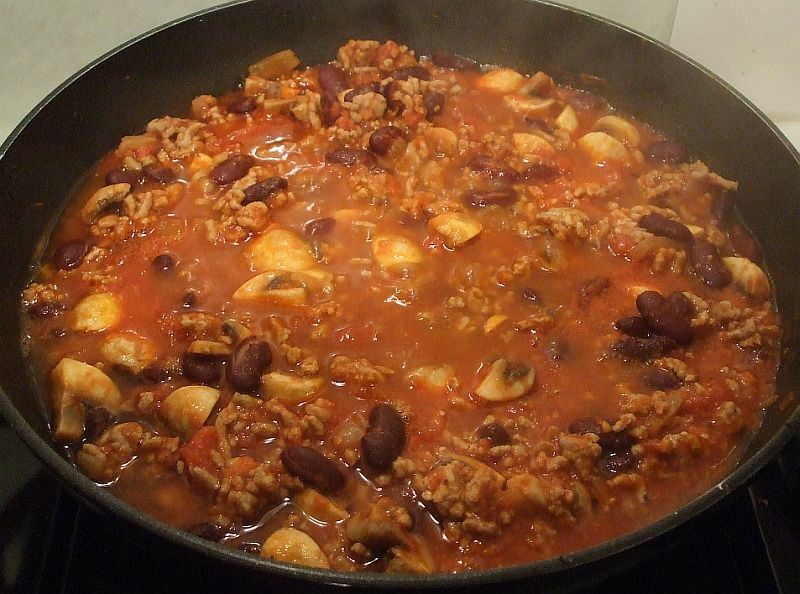 However this is a brilliant dish for guests as everything can be prepared and final touches are done in a jiffy. And for vegetarians you just leave the chicken away and give them a bit more mushroom and peppers. If you want to be generous, then steam a few broccoli flowers to put on top. 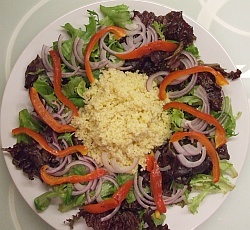 wash and strain the bulgur carefully and mix with the dressing. keep covered for another 2 hours, stir after 1 hour. Peel the mushrooms. I have a rule of thumb. If the peel of the head comes off easily they get peeled, whether they are closed or not. From the base I cut off a few millimeters. 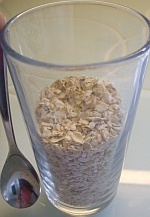 If the base is hollow I remove it. This way I don't have to wash them. Mushrooms take on water very quickly, if you have to wash them do this quick and briefly and strain well. roast the pepper either over an open flame of the hob (+1 minute of Microwave at the end) or under the grill. Keep everything covered until you are ready to go. 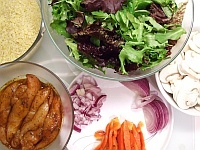 Instead of oil and spices mix oil and 2 tbsp of dark soy sauce to marinade the chicken. If you want to do both versions in one go, take some of the mushrooms out and put it on the veggy plates before you add the juice to from the chicken.